Well, it’s pretty obvious what this week’s Venture Bros. T-shirt is going to be! 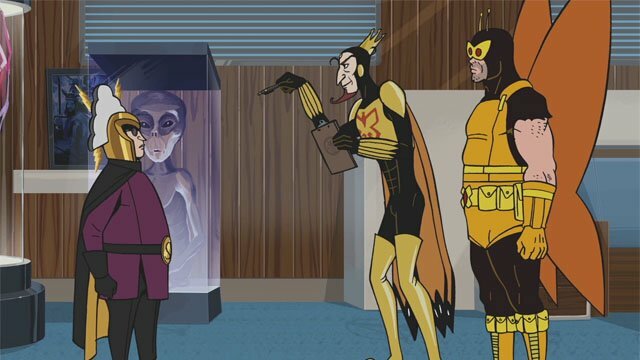 After last week’s episode, the OSI and the Guild of Calamitous Intent have a new treaty in place thanks to some unexpected diplomacy from Rusty Venture. However, Doctor Mrs. the Monarch discovered that Guild Agent S464 was secretly working for the Peril Partnership, a rival group. 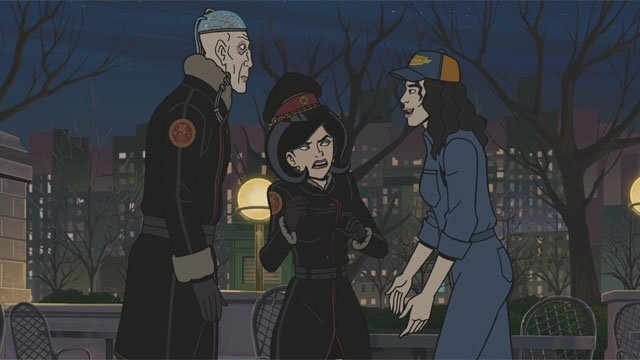 In The Venture Bros. season 7 episode 6, things get back to normal with a new round of Level 1 arching. The Monarch and Gary got an overdue tour of the Guild’s headquarters before joining the “Big Villain” program. Augustus St. Cloud was chosen as to be their pupil, but he was less threatening than Professor Chaos. Even the smallest touch of true villainy was beyond St. Cloud’s grasp. Billy Quizboy’s mother, Rose, and Colonel Gentleman also beat the hell out of St. Cloud during his failed recon mission. Gary and the Monarch offered him as much guidance as they could, and they set St. Cloud up with the best weapons he could buy from the Guild. Pete White and Billy freaked out about St. Cloud’s threat. However, Brock Sampson and Rusty knew better than to take a Guild Level 1 arching seriously. Rusty only became more involved once he realized that St. Cloud was backed by the Monarch. To strike back via proxy, Rusty hooked up Billy and White with the costumes of Delta Boy and Killer Drone. But in their own way, Billy and White proved to be just as ineffective as St. Cloud. Not even some hard lessons from Brock prepared the duo for their pitiful arch nemesis. Back at Guild headquarters, Dr. Mrs. the Monarch interrogated S-464 to get him to turn on the Peril Partnership. She succeeded after vividly describing the torture she had in mind for him. S-464 was largely ambivalent about turning, but he did want to save his relationship with OSI Agent Kimberly McMannis. One Doctor Z fantasy shopping montage later, Dr. Mrs. the Monarch came up with the idea to use St. Cloud’s arching to their advantage. She arranged for St. Cloud to be armed with Level 6 weaponry, which forced Kimberly to respond on OSI’s behalf. St. Cloud’s weapon did prove to be more dangerous than expected, but his battle with Billy and White was pathetic. It was practically over before it began when St. Cloud gassed himself and the allegedly heroic duo with hallucinatory laughing gas. Dr. Mrs. the Monarch’s plan to reunite S-464 with Kimberly worked like a charm, but she almost threw it all away to fight Kimberly. The Monarch showed up just in time to restrain his wife, in a rare role reversal. Hours later, Billy and White recounted their triumph over St. Cloud to Hank and Dean. Rusty and Brock knew the truth about their hallucination of victory, but decided not to tell them about it. 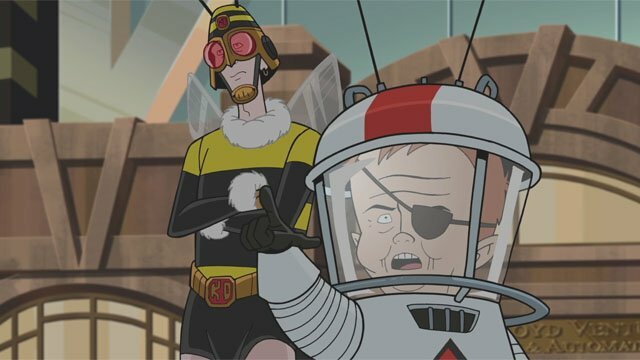 What did you think about The Venture Bros. season 7 episode 6? Let us know in the comment section below! 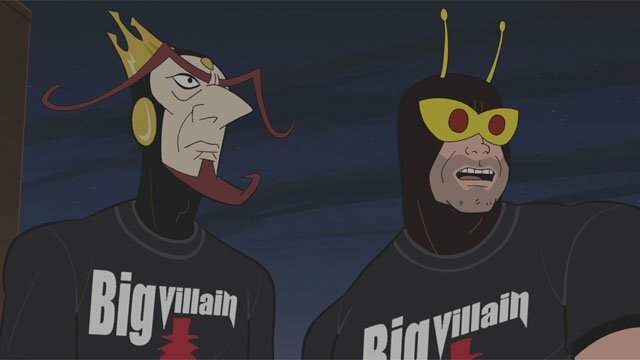 The post The Venture Bros. Season 7 Episode 6 Recap appeared first on ComingSoon.net.